FALL RIVER, Mass. 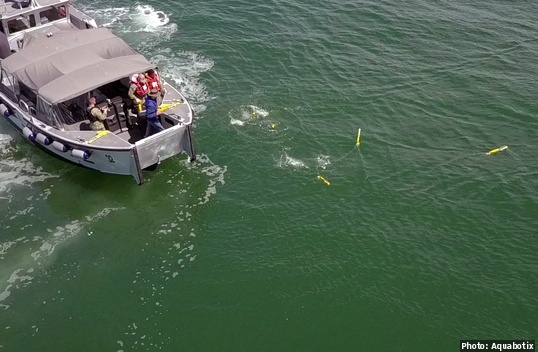 Undersea robotics company Aquabotix has signed an agreement with the U.S. Navy to gain access to the Navy's Narragansett Bay Test Facility (NBTF) in Newport, Rhode Island, including its ranges and personnel, in order to test and demonstrate the Aquabotix’s SwarmDiver product and other relevant technologies. Under the terms of the special-purpose Cooperative Research and Development Agreement (CRADA) with the United States Naval Undersea Warfare Center (NUWC) Division Newport, Aquabotix plans to test and demo the SwarmDiver unmanned undersea vehicles (UUVs). The UUVs are designed to use wireless communications protocols and advanced swarming algorithms to allow for multiple grouping patterns to meet varying mission requirements, including synchronized dives and data capture operations. using onboard sensors.